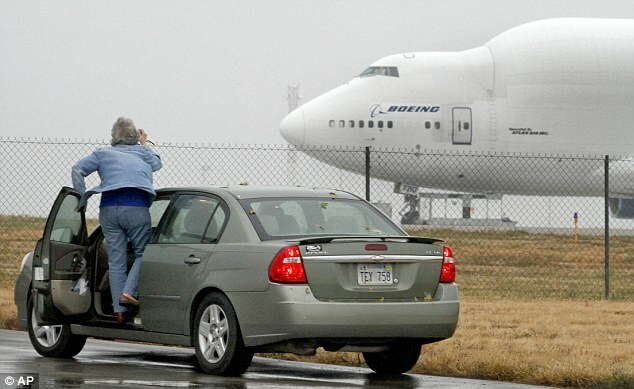 A Boeing 747 jumbo jet that mistakenly landed at a tiny Kansas airport recently took off and landed at its intended destination after hours grounded while officials figured out how to negotiate the small runway. 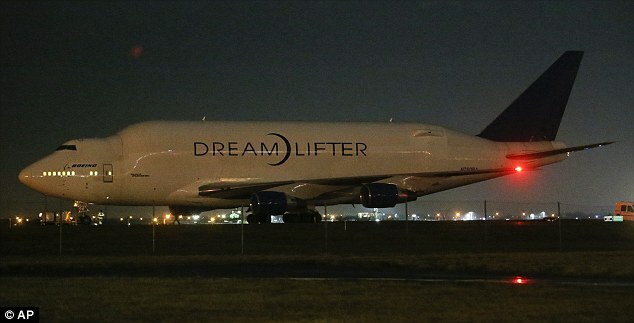 The 235ft Dreamlifter jet landed at Jabara Airport in Wichita - which is considered 3,000ft too small for the large craft - instead of McConnell Air Force Base, which is about eight miles away. Although differing in size the two airports have a similar runway configuration and it is believed the pilot landed there by mistake. According to air traffic control recordings of the flight, the aircraft was cleared to land at its intended airport and the crew confirmed its clearance back to the controllers at McConnell AFB. More than ten hours after the mix-up an airport official confirmed they had managed to turn the plane on the tiny runway and determined it could take-off. 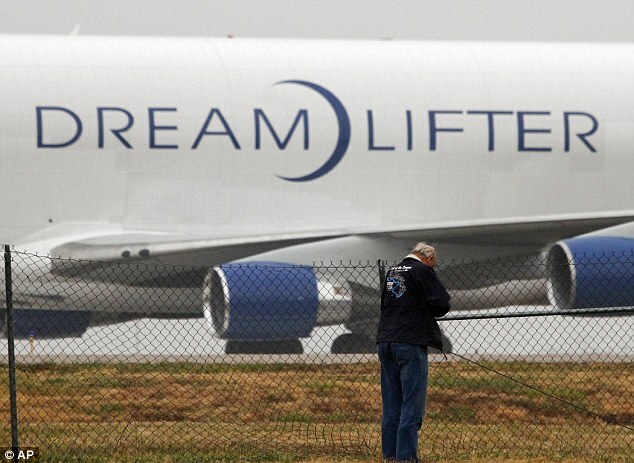 Close call: The huge Dreamlifter jet takes off from Jabara with little runway to spare. The 235ft craft normally needs a 9,100ft strip to take off from - the Jabara runway falls 3,000ft short of that. Officials shut down a highway nearby the airport and surrounding roads as a safety precaution before the takeoff. A crowd gathered by Jabara to watch the plane take off from the 6,100-foot-long runway, which was about 3,000 feet shorter than is ideal. However, the take-off went without incident as onlookers cheered and the craft landed at its intended destination fifteen minutes later. 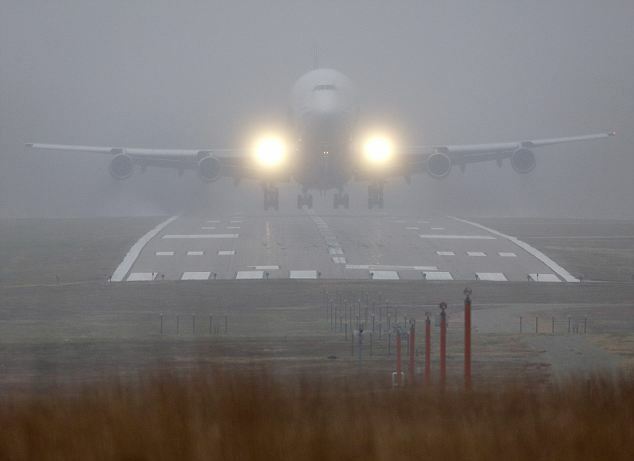 The 747 aircraft, one of the biggest cargo planes in the world, touched down at Jabara at 9.38pm on Wednesday night - eight miles from its intended destination. Upon landing, the crew of the plane radioed in and told them they had landed at Beech Factory Airport, another small landing base about six miles away. 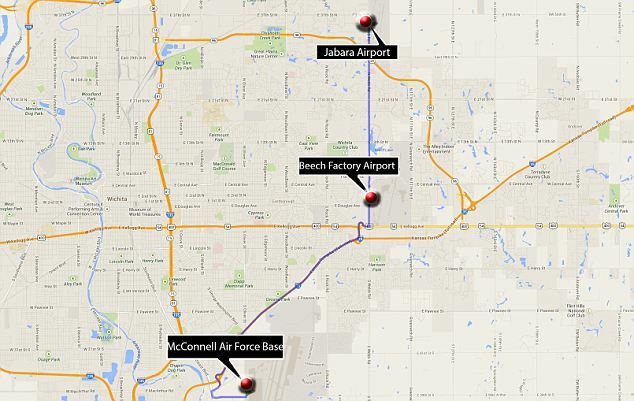 The had to be told by controllers they were actually at Jabara airport. Atlas Air spokeswoman Bonnie Rodney declined to answer questions and referred inquiries to Boeing. "We are working with Atlas Air to determine the circumstances," Boeing said in a written statement. The Federal Aviation Administration planned to investigate whether the pilot followed controllers' instructions or violated any federal regulations. The pilot sounded confused in his exchanges with air traffic control, according to audio provided by LiveATC.net. "We just landed at the other airport," the pilot told controllers shortly after the landing. Once the pilot says they're at the wrong airport, two different controllers jumped in to confirm that the plane was safely on the ground and fully stopped. The pilot and controllers then went back and forth trying to figure out at which airport the plane was. At one point, a controller reads to the pilot the coordinates where he sees the plane on radar. When the pilot reads the coordinates back, he mixes up "east" and "west." "Sorry about that, couldn't read my handwriting," the pilot said. A few moments later, the pilot said he thinks he knows where they are. He then asks how many airports there are to the south of McConnell. But the airports are north of McConnell. "I'm sorry, I meant north," the pilot said when corrected. "I'm sorry. I'm looking at something else." They finally agree on where the plane is after the pilot reports that a smaller plane, visible on the radar of air traffic control, has just flown overhead. No damage was reported or injuries to the two-person crew. Belly of the beast: Boeing employees wait to unload the super freighter 'Dreamlifter' aircraft. The tail of the specially designed 747 freighter swings open for huge payloads that are unloaded using one of the largest cargo loaders in the world. The modified 747 is one of a fleet of four that hauls parts around the world to make Boeing's 787 Dreamliner. 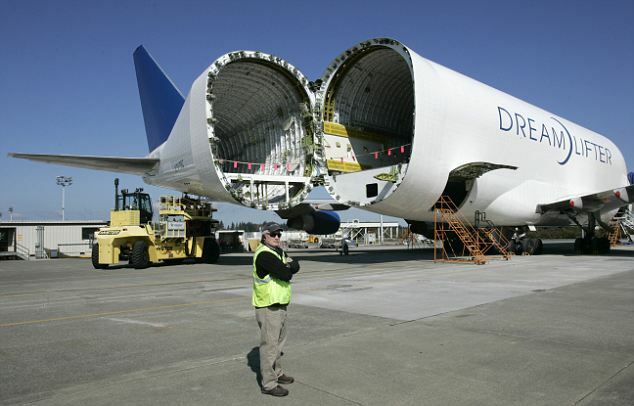 The "Dreamlifter" is a 747-400 with its body expanded to hold whole fuselage sections and other large parts. If a regular 747 with its bulbous double-decker nose looks like a snake, the bulbous Dreamlifter looks like a snake that swallowed a rat. According to flight-tracking service FlightAware, this particular DreamLifter has been shuttling between Kansas and Italy, where the center fuselage section and part of the tail of the 787 are made. McConnell is next to Spirit AeroSystems, which also does extensive 787 work. The nearly finished sections are then shipped to Boeing plants in Everett, Wash., and North Charleston, S.C. for assembly into finished airplanes. Boeing is on track to make 10 of them per month by the end of this year. Because 787 sections are built all over the world - including wings made in Japan - the Dreamlifters are crucial to the 787's construction. 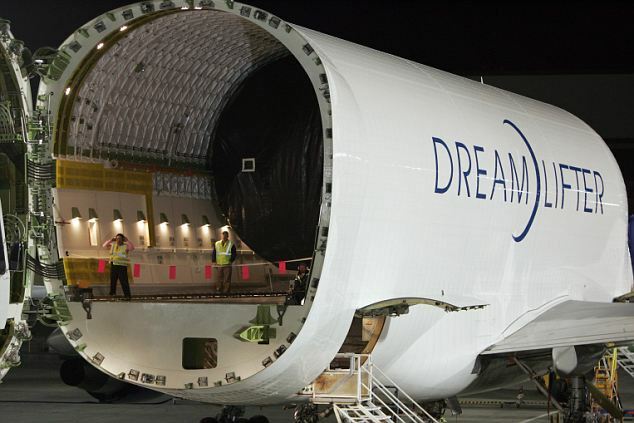 Boeing says the Dreamlifter cuts delivery time down to one day from as many as 30 days. 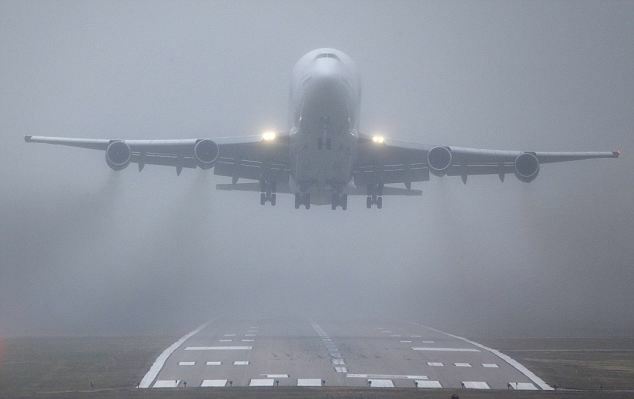 Although rare, landings by large aircraft at smaller airports have happened from time to time.